A new Windows means a new Windows Server. We look at what's new in Windows Server 2012. While Windows 8 gets much of the attention, it's not the only big change happening at Microsoft. Along with a new desktop operating system, it's is also renewing its server software, Windows Server 2012. Like Windows 8, this is a re-imagining of Windows, rethinking how we use servers, and how we're going to use them over the next decade or so. That reimagining means that Microsoft is using Windows Server 2012 to address two key challenges for any business, from the smallest to the largest. Both are complex, and both could mean changing the way we implement networks and applications, and how we manage users and devices. The first is making business networks ready for the cloud, whether it's working with private clouds in our own networks, or with public cloud services like Microsoft's own Azure. The second is the growing issue of Bring Your Own Device (BYOD), where unmanaged, and often unmanageable, phones and tablets are used in corporate networks. There's also a lot of work around securing and managing storage, as your data isn't going to go away. Installing Windows Server 2012 brings up the first big change, as Microsoft has made the User interface-less, Server Core the default install option. That's not just because Server Core has a smaller attack surface and is easier to keep up to date, it's also due to Microsoft adding a lot more in the way of server automation via PowerShell and Windows Management Instrumentation (WMI). With over 2400 PowerShell commands in the new Server, and the ability to remotely execute commands on servers, Microsoft is expecting that many Windows Server 2012 systems will be managed by command-and-control servers using the new look multi-server Server Manager, by desktop PCs using the Remote Server Administration Tool (RSAT), or from its System Center management platform. Of course it's still possible to install the full Windows Server user interface, and many small and medium sized organisations will prefer to work with the familiar desktop. At the heart of the server User Interface (UI) is a revamped and Metro-styled Server Manager. While in the past you probably just clicked it away, in Windows Server 2012, the Server Manager is a one-stop shop for managing and controlling not just one, but whole groups of servers. It's used to install server roles and features, as well as monitoring operations and handling errors and issues. It's not the only new feature in the Windows Server 2012 UI, as it's joined by a version of the Metro start screen first seen in the consumer version of Windows 8. 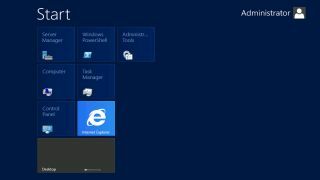 In practice you're unlikely to use the start screen much – in Windows Server it's a tool for finding applications and tools which can then be pinned to the desktop taskbar. There's a third user interface option, one with limited UI controls, which lets applications with their own UIs work on a server with few management tools (letting you have Server Core-like performance and security with applications that won't run on Server Core). You'll need to use the server management tools to remove most of the Windows Server UI once you've installed the applications you plan to run – as you'll lose the Explorer and Server Manager. Microsoft's vision of the private cloud is one where services are deployed to virtual machines as and when they're needed. While much of that vision depends on its System Center management tools, the engine that drives it all is the Hyper-V virtual server tools – and the latest version of Hyper-V, 3.0, is part of Windows Server 2012. Microsoft is well-known for getting things right in version 3, and that's true of Hyper-V 3.0. Most obvious is the raw power of Microsoft's Virtual Machine (VM) platform, with support for 64 virtual processors and 1TB of memory in each virtual machine (and up to 4000 VMs on a 64-node cluster).